Sustainable Little Tokyo (SLT) and Nikkei Progressives (NP), two local community groups based out of the Little Tokyo neighborhood, delivered over 2,500 petition signatures to Councilmember Jose Huizar’s office on Sept. 11, calling for the council district office’s support in maintaining community control of the First Street North block. Activists, stakeholders, and allies are petitioning city officials to allow the publicly owned block to be developed by and for the Little Tokyo community. 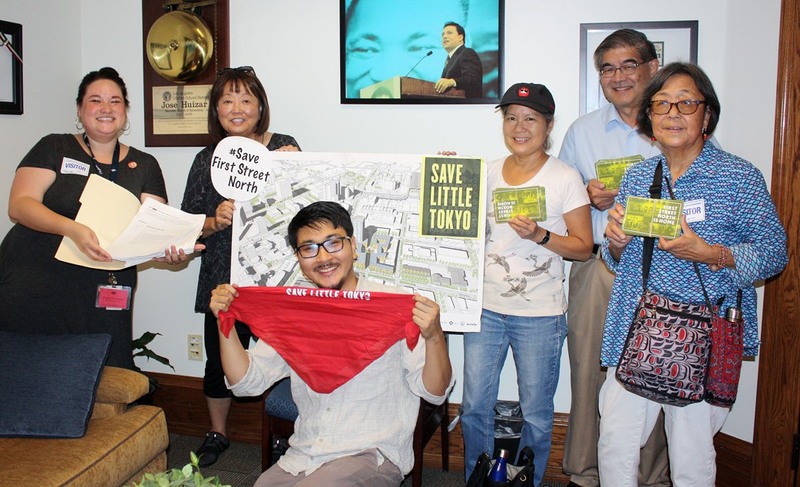 Located behind Far Bar, Suehiro, Fugetsu-do, and many more shops, First Street North is one of the last three remaining pieces of land that can be controlled by the community – and it could end up in the hands of private developers if the city does not hear the community’s voice. First Street North is home to some of Little Tokyo’s most important cultural institutions, legacy businesses, and historic sites. Founded in the 1890s, Little Tokyo is the largest of only three remaining Japantowns in the United States. The neighborhood has persisted in spite of repeated acts of displacement, such as the forced uprooting and incarceration of Japanese Americans during World War II and the demolition of businesses, cultural and religious sites, and housing in the wake of urban renewal and Civic Center expansion in the 1950s and 1960s. What remains of Little Tokyo is approximately nine square blocks that serve as the cultural center for Japanese Americans across Southern California. The volume of petition signatures collected over a short period of time represent a strong political will to retain the character and interests of Little Tokyo, while stymieing further gentrification throughout the development of the block. Sustainable Little Tokyo is a community-driven initiative working to ensure a healthy, equitable, and culturally rich Little Tokyo for generations to come. SLT began in 2013 as a multi-day community vision effort and has evolved into a holistic, neighborhood-wide campaign to promote the environmental, economic, and cultural sustainability of Little Tokyo. Nikkei Progressives is a multi-generational community organization made up of individuals who care about issues of justice, fairness and solidarity, carrying forward the legacy of Japanese American redress and supporting other communities. NP was established after the 2016 election in response to attacks on civil liberties and the need to offer support and resistance. For more information, visit the SLT website at sustainablelittletokyo.org/fsn.